Located in Enfield, North London and commissioned by a Doctors Surgery, this bespoke Modular Building provides essential secure storage for medical records in a modern Doctors Practice. This Prefabricated Building provides an additional floor area of 30 sq. metres and incorporates electric heating and lighting as well as a secure entrance door with 5 lever locking system. The floor structure has been reinforced to cater for the extra weight loadings associated with the racking and medical records and is finished in heavy-duty vinyl. Externally, the walls are finished in resin based texture whilst the roof has a bespoke 6 degree mono pitch roofing system. 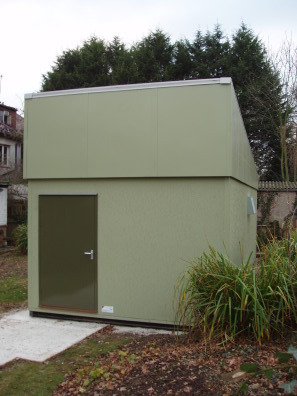 Due to site constraints, this Portable Building was located within the garden at the rear of the Surgery!